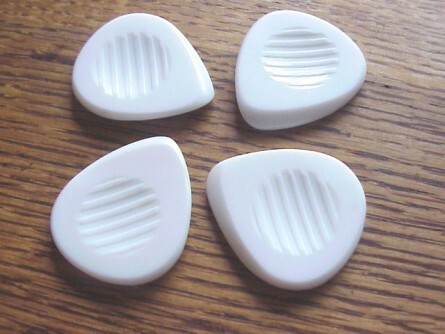 Having gone through a variety of different picks over the years, I recently discovered the Dunlop Jazz III. I think this could be the one. Can there be 'the one' when it comes to picks? I will of course be buying some of these picks to try them out. I've never liked a solo violin, you need at least five for a proper fire. Random Guitarist wrote: Can there be 'the one' when it comes to picks? TBF, while I do prefer and use the smaller "Twins" version for electric (about the same size as the dunlop mentioned in the OP but still 3.5mm thick) I'm happy using these for everything and they're what I always have to hand. Similar principle, big, fat and heavy. Better control, drive the top hard when required (particularly archtop and Selmer style guitars but works well on a big dread too) and hard material retains more brightness than softer plastic pics. I'd have though the slightly less brightness of a fat pick would suit a Tele, never renowned for being a 'mellow' guitar? I don't play Teles (but keep nearly buying one......) but Strats mainly (one vintage rep and one with P90s) and those pics work great for me. I've been using the Dunlop Tortex 1.14mm picks for donkey's. The grip is just perfect, I rarely have it slip out of my fingers and it's really comfortable to hold. The thickness as well helps me to play fast (although I'd never claim to be good at "shredding"). With a distorted electric sound pretty much anything goes, the pic makes little difference to the tone (if you favour heavier stings too thin a pick will lose you dynamics) but on acoustic guitars thin picks are the kiss of death. Ok, it is personal preference, but if you spend several thousand pounds on a nice acoustic you want it to sound as the builder intended and a 0.6mm nylon pick just ain't going to do that. edit :- a thought has just occurred to me, maybe the thinnest pick you should ever consider using on an acoustic guitar should be at least as stiff as your thumbnail....... For me that's around a 1mm tortex but I still prefer much stiffer than that as if I'm flatpicking I probably want to be louder than I could get with fingernails. With the small proviso that if you're recording (rather than for live use), sometimes all you want is that almost-brush-like sound of a thin pick tickling the strings. So having a good selection lying around is always useful. I do reach for different picks depending on acoustic or electric instruments. Because of these pick threads I've been noticing I tend to reach for a Dunlop nylon more often than not. blinddrew wrote: With the small proviso that if you're recording (rather than for live use), sometimes all you want is that almost-brush-like sound of a thin pick tickling the strings. Sam Spoons wrote: With a distorted electric sound pretty much anything goes, the pic makes little difference to the tone (if you favour heavier stings too thin a pick will lose you dynamics) but on acoustic guitars thin picks are the kiss of death. Ok, it is personal preference, but if you spend several thousand pounds on a nice acoustic you want it to sound as the builder intended and a 0.6mm nylon pick just ain't going to do that. I used to think thin picks were better for acoustic, until I was corrected by this very forum! You use what bloody pick you want, and if it's easy to play and makes you happy, then keep using it. There are no right or wrongs here, just personal preference and differing techniques and sound preferences. But do experiment. You might try a heavier pick and hate it, so don't use it just because someone else says it's the right pick to use. On the other hand you may love it, in which case, stick with it. And vice-versa with thin and medium picks. Purely out of interest, what do you use on acoustic now Garrett? Same as my electric. The 1.14 mm pick. I used to use the thinnest Tortex around but I switched when I started using the 1.14mm on my electric. I still believed the thinner one was better for struming but I mainly play blues lead now. Basically when strumming the thinner picks make me feel a bit looser as they hit the strings, if that's the right way to put it, but I couldn't be arsed to buy two different picks. That money is better spent on something more important. Like beer. garrettendi wrote: , but I couldn't be arsed to buy two different picks. Yep I tend to agree that's why I've got a big box of of different picks because I keep looking for the one pick that does everything, if you follow me. These days I've pretty much settled on Ultex Sharp 1mm, but will play with anything from that up to a 50p piece. My favourite pick is a piece of real tortoiseshell but I am so paranoid about losing it that it's locked away and I never use it. I've also got a bit of thin pebble I found on a beach I like, similarly hidden somewhere safe. How daft is that. I do the same with clothes - never wear the stuff I like in case I'm sick on it or something. getting better all the time..
Strumming with a hard pick is just technique like anything else. You need to be more accurate but loose. It's definitely better for more sophisticated strumming/picking/muting techniques but definitely not as forgiving. Re Tortoiseshell, Michael Wegen uses a material reputed to be very close in feel and sound, and it's readily available so no worries about wearing them out (though he says he will replace a worn out pick foc) or them getting lost. Sam Spoons wrote: Strumming with a hard pick is just technique like anything else. You need to be more accurate but loose. It's definitely better for more sophisticated strumming/picking/muting techniques but definitely not as forgiving. Yeah I'm happier with anything over 1mm up to anything really. Jack of some trades on the guitar so tend to use the same pick for electric, acoustic and mandolin, can't be bothered switching picks between songs, just something else to go wrong. I guess I've learned to be not too fussy and get on with what I've got. I tried one of those gypsy Wegen picks recently (being used by another player), got on with it fine and might well look into one of those.. Bigger problem is my nails. Had some acrylics put on in March, which were great and lasted well into May, but now they are off my nails are in a dreadful state - dried out, flaky, thin, basically useless. I use my Wegen GJ picks for everything as I said above. If you want something a little more economical try his BlueGrass picks, they look like a standard tortex with some holes in but are 1.4mm thick and made from Michael's super hard pic material. I have a few as my backup picks. Sally Hansen Diamond Nails for me. I'm not gigging but play two plus hours a day with fairly heavy strings and a twelve string and my nails keep fine. Alba wrote: Sally Hansen Diamond Nails for me. So the stilettos and fishnets are just a lifestyle choice then?